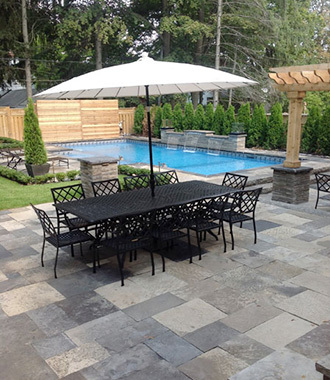 Over the years, Couture Landscapes in Oakville has helped many homeowners bring the ambiance and experience of their favorite resorts and getaways, right to their backyard. With years of experience in the creation of exquisite backyard landscaping, we are confident in being able to offer you an elegant oasis that you’ll be able to enjoy and cherish for years to come. If you live in Southern Ontario – whether in Oakville, Burlington or South Mississauga – you are living in one of the most prestigious paradises of Ontario. With the help of our expert Oakville landscapers, you can bring the majestic feel of any outdoor space right to your very own backyard! Couture Landscapes is one of a kind – known for their creative landscaping designs and knack for turning dull open areas into comfortable, memorable and functional outdoor living spaces. We work one-on-one with our customers to understand their needs, wants and interests. Using this information, we combine the ideas of our creative landscapers to create designs and themes that will fit the overall ambiance requested. With our help, you can distinctively improve the look of your backyard. Couture Landscapes offers complete personal, courteous and honest service – ensuring 100% satisfaction. With years of helping homeowners transform their backyard and front yard in Oakville and the surrounding areas – we’ve been fortunate enough to have the business of many referrals. It is your complete satisfaction that makes our reputation – so you can rest assured knowing you’re in good hands. It is through our consistent level of service and proven track record that customers have entrusted us in all their residential landscaping projects. If you or someone you know requires landscaping in Oakville, don’t hesitate to consider the experts behind Couture Landscapes. For all your backyard landscaping in Oakville, Burlington and other areas of Southern Ontario – please call Couture Landscapes at 416-707-9492.